This message is appearing because we can't show the site at its best in your older browser. You'll still be able to read the text, but if you upgrade to a newer browser (and it doesn't have to be Explorer!) you'll notice the difference. With a small smattering of new material, and thanks to Nick, sometimes standing in for Anna while her children grow a bit more, and still pondering that third album. Go to Facebook and friend us. Now. Gigs 2018: two big Summer festivals! Exile Music Festival, Sabine Hay, off Oldfield Lane, near Darley Dale, Derbyshire DE4 2LN (Exile festival directions): Friday 22 June 2018. Yes, we're headlining on Friday night at this beautiful little festival on Saturday in a beautiful picturesque setting - it'll be amazing! See the full 3-day lineup here. Saturday night, so plenty of time to get there and get settled before we go on around 10pm. If you've never been before, this is a fantastic and well-run event (off the main festival circuit with lovely people :-) and not to be missed. You can camp or stay nearby! A rather special and very spectacular fancy-dress ball with stilt walkers, fairies, witches, goblins, steampunk, unicorns… errr… Star Wars (you name it, there's a costume for it) and other acts, with the rather energetic Shamus O'Blivion ending the night! Part of the annual Silk Mill Parade, this will be well worth it as more bands are playing throughout the day. Exile Music Festival, Sabine Hay, off Oldfield Lane, near Darley Dale, Derbyshire DE4 2LN., Saturday 25th June. A fantastic little festival in a beautiful picturesque setting. We're headlining on the Saturday - it'll be amazing! We're headlining again on Friday night, so plenty of time to get there and get settled before we go on around 10pm. If you've never been before, this is a fantastic and well-run event (off the main festival circuit with lovely people :-) and not to be missed. The 'Belper Exile' festival Sabine Hay, off Oldfield Lane, near Darley Dale, Derbyshire DE4 2LN: Late evening, Saturday 6th July 2013. The festival website says: “The State of Loscoe is about operatic survival with a classic loyal fan base. Ben will pipe you into the musical mystery tour of their enchanting, must dancy set to want more and more.”. A fantastic and varied night with Attila the Stockbroker, Blair Dunlop, and Fred Baker. A benefit gig for the unemployed - more details here. Stainsby Festival, Brunt's Farm, Stainsby, Chesterfield: Saturday 23rd July, headlining. EcoFest, Badger Farm, Asterby, Louth, Lincolnshire LN11 9UF : Sat 18 June. Lovely setting, great organisation and stage - thanks to everyone! The 'Belper Exile' fesitval Sabine Hay, off Oldfield Lane, near Darley Dale, Derbyshire DE4 2LN: Sun 3 July. The Barely Mow, Bonsall, Derbyshire DE4 2AY (Tel 01629 825685): 29 April. A fundraiser for The Peoples Charter (see the poster!). A great night, for everyone who stayed to the end! 'twas a birthday to remember for a good friend and Loscoe fan. 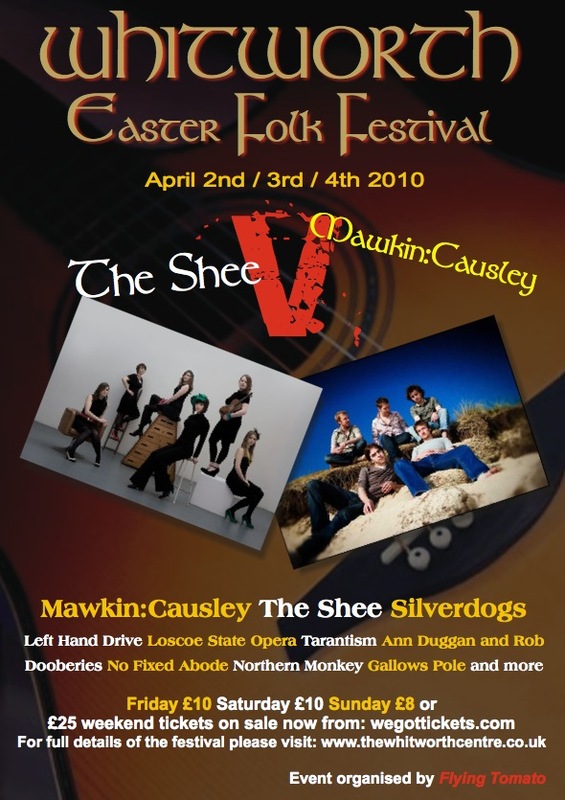 Whitworth Easter Folk Festival, The Whitworth Centre, Darley Dale: Sat 03 April, 7pm. See the great videos of the gig on YouTube - the ones marked 'Whitworth' (by kind permission from Pete Simmonds)! See the poster. Snow falling heavily, so a short free set - thanks for the donations, and for turning up in the winter weather! The Fishpond is reborn (with great staff, sound system and lighting)! The new songs and forthcoming 3rd album material went down well. Lots of you asked where we were this year - we'll be there soon! Last time: brilliant crowd, very muddy. 'werewolf2' wrote a nice review of us at Stainsby a couple of years ago. We were featured on Aural Innovations Sonic World Festival 2009 Special, which you can download for free. Yeah. We thought about it for a bit at a practice, and realised that we've been around for 10 years. Three of us have been on the journey from the start, two of us involved in one way or another since then, and two of us for the last couple of years or so. After a million years of gigging, we've set up a Loscoe State Opera Myspace profile at last! That didn't take too long, did it? Seriously, previous MySpace upload limits and email problems got in the way, and now they're all fixed. Be our friend. You can buy our CDs from this website. Go on. You know you want to. Got them all? Buy one as a present for your friends/familiy! After losing both our domain name (to some idiotic US 'business' with no use whatsoever for loscoestateopera.com domain apart from mindless greed), and Kev (bass), and Andy's eye trouble (and other stuff) we almost lost the will to live… but not the will to continue playing :-) so yes, things have been difficult, and it's taken a while to get back on our feet… but - despite rumours to the contrary - we're still here! We're working on new material, which will get heard at gigs now our new Bass player John is settled in (watch out for the electric cello!). This was ages ago, but who cares? Kate's other band James Warner Prophecies (myspace.com/thejameswarnerprophecies) played on Kerrang Radio on 26th April (errrr… two years ago, that is) as part of the Ugly Phil Breakfast Show. As well as three of their own live numbers they also performed their specially composed Kerrang jingle Let Satan Make Your Toast . (And that's an order) sample tracks have been restored to our music page, and you can purchase CDs online via Paypal. We're also in New Day Records' catalogue. They distribute all our albums at various festivals and gigs up and down the country. Book Loscoe State Opera now!